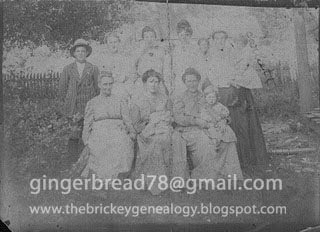 Back row, left to right: James Emmett Brickey, unknown, Jaley Ella Brickey, unknown, unknown, Martha Melinda Kerns holding Robert Corbett Brickey. Front row, unknown, Mary Virginia Brickey holding Connie Ethel Cox, and Mary Kerns (sister of Martha Melinda Kerns) holding unknown. If you can identify any others in this photo, please contact me.